Delft (AFP) - Appearances contemporary wayang kulit "Willem van Oranje" that was delivered from Yogyakarta Ki Ledjar Soebroto accompanied by his grandson succeeded in riveting Ananto Wicaksono more than 600 spectators in six performances at the Museum Nusantara, Delft, Netherlands, Sunday. 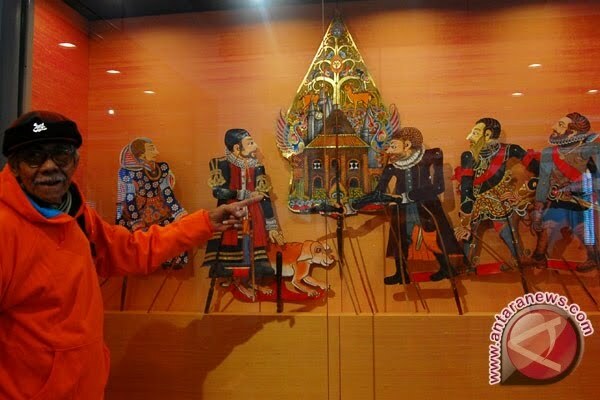 The series of leather puppet show "Willem van Oranje" as part of the reopening of the Museum Nusantara Delft, said Ananto Wicaksono in a special interview with correspondent Between London, Sunday. Show Willem van Orange leather puppets that lasted one hour with the appearance of a portrait of puppet characters in the history diiringin supportive atmosphere with music performances. One of the spectators from the Netherlands, Geert van Waveren recognize contemporary puppet show tells the story of Willem van Oranje is performing a very unique and interesting. Geert van Waveren, child specialists acknowledge that contemporary puppet shows are a different puppet show with puppet shows, and usually first-time visits. Puppet show "Willem van Oranje" was first performed in the Netherlands March 11 and then it tells the story of the Netherlands Willem van Oranje ruler who was killed on in 1584 by Balthasar Gerards French. Prince William, who was nicknamed and known as William of Orange or nickname William the Silent, and in the Netherlands is often referred to as Father of the Nation. According Ananto Wicaksono, for the Netherlands, Prince William, who was born at Castle Dillenburg, 24 April 1533, a special place their hearts. Mentioned in the first William was governor for the king of Spain but later opposed the initiator and leader of the rebellion against the ruler of the Netherlands, Spain, King Philip II. Mbah artificial leather puppet shows Ledjar often displayed in Tong Tong Fair, Europe's largest Eurasian performances held each year in The Hague is a special order Museum Nusantara. Two years ago Ki Ledjar Soebroto bring Puppet Revolution. This year will bring plans Ki Ledjar Wayang Kulit on the eruption of Mount Merapi last year. In addition to the leather puppet show, a set of leather puppets made by Ki Ledjar Soebroto also be used as the permanent collection at the museum. Wayang Kulit Ki-made other Ledjar has also become the permanent collection at various museums in the Netherlands, among others, Wayang Kulit VOC in Westfries Museum, Hoorn, and Wayang Kancil at the Tropenmuseum, Amsterdam. According to Cindy Smits, Dutch citizens who also teaches at the Institute Indonesische Cursussen in Leiden, the afternoon show was very interesting and different from the puppet show that he had seen earlier. Meanwhile, an archeology in one of Prof. Hedi Hinzler wayang performance that helped the implementation of Willem van Oranje acknowledged that a main puppet shows are a means of education for Dutch society, especially children. Hedi Hinzler, Asian antiquities expert acknowledged that with a main wayang show "Willem van Oranje", Dutch citizens can witness history in other forms. According to Nana, made puppets which tells the struggle of Prince William in the form of puppet intended as an educational vehicle for children to understand about the history of the Netherlands.